Most users know how to use the Cut/Copy and Paste commands. They've been around since the early days of word processing, and they're universal across almost every Windows application and Windows itself. A lightning refresher: select some text, press Ctrl-X to cut or Ctrl-C to copy, put your cursor somewhere else, then press Ctrl-V to paste. What could be simpler? Of course, Microsoft Word 2007 and 2010 lack the traditional Edit menu, so you'll have to look elsewhere. The Paste option lives on the left edge of the Home tab, but don't just click that clipboard icon; click the bottom half of the button, the one with the down arrow. 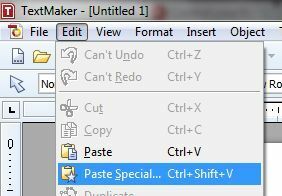 That'll produce a handful of Paste options, one of which is Paste Special (represented by a clipboard with a bold letter 'A').